The Global Volcanism Program has no activity reports for Morne Diablotins. The Global Volcanism Program has no Weekly Reports available for Morne Diablotins. The Global Volcanism Program has no Bulletin Reports available for Morne Diablotins. This compilation of synonyms and subsidiary features may not be comprehensive. Features are organized into four major categories: Cones, Craters, Domes, and Thermal Features. Synonyms of features appear indented below the primary name. In some cases additional feature type, elevation, or location details are provided. 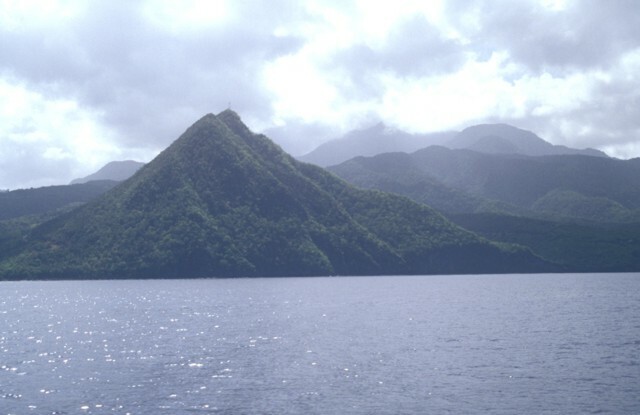 Morne Diablotins, in northern Dominica, is the largest and highest on Dominica and the second highest peak of the Lesser Antilles. A complex of at least five coalescing lava domes forms the broad summit, and other domes are found to the SE. Pyroclastic-flow deposits emplaced ~22,000-40,000 years ago, known as the Grand Savanne Ignimbrite, extend in five radial tongues around the volcano as far as the coast. Pre-Columbian block-and-ash flow aprons on the NW flank are relatively unmodified by erosion. No historical eruptions are known, although numerous hot springs, both onshore and submarine, are found near Glanvillia, on the NW flank. Severe earthquake swarms in 1841 and 1893 originated either from Morne Diablotins or Morne aux Diables to the N.
Bellon H, 1988. Reconnaissance chronologique des deux premieres phases d'activite volcanique en Dominique (Petites Antilles). Compte Rendus Acad Sci Paris, 306: 1487-1492. Lindsay J M, Smith A L, Roobol M J, Stasiuk M V, 2005. Dominica. In: Lindsay J M, Robertson R E A, Shepherd J B, Ali S (eds). Volcanic Hazard Atlas of the Lesser Antilles, Trinidad and Tobago, Seismic Res Unit, Univ West Indies, p 1-47. Robson G R, Tomblin J, 1966. West Indies. Catalog of Active Volcanoes of the World and Solfatara Fields, Rome: IAVCEI, 20: 1-56. Shepherd J B, 1989. Eruptions, eruption precursors and related phenomena in the Lesser Antilles. In: Latter J H (ed), Volcanic Hazards - Assessment and Monitoring, Berlin: Springer-Verlag, p 292-311. Shepherd J B, 2001. Volcanoes of the eastern Caribbean: past activity and future hazards. Paper presented at the Workshop on Volcanic and Seismic Hazards in the eastern Caribbean, May 28- June 1, 2001, 57 p.
The Global Volcanism Program is not aware of any Holocene eruptions from Morne Diablotins. If this volcano has had large eruptions (VEI >= 4) prior to 10,000 years ago, information might be found on the Morne Diablotins page in the LaMEVE (Large Magnitude Explosive Volcanic Eruptions) database, a part of the Volcano Global Risk Identification and Analysis Project (VOGRIPA). There is no Deformation History data available for Morne Diablotins. There is no Emissions History data available for Morne Diablotins. 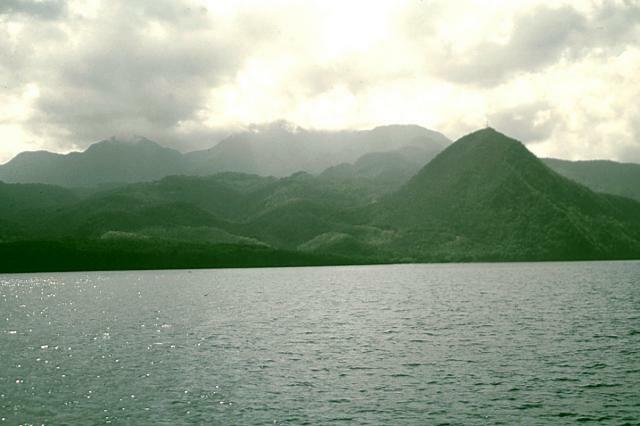 Cloud-draped Morne Diablotins (center) is the largest volcano on Dominica and one of the largest of the Lesser Antilles. It is seen here from the south beyond Morne Trois Piton volcano at the far right. 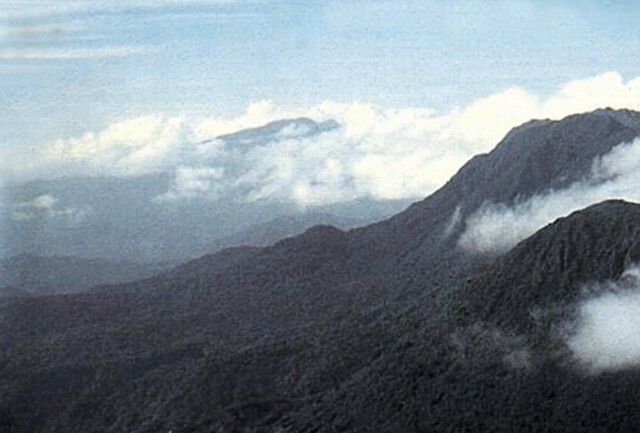 Two coalescing lava domes form the summit of 1430-m-high Morne Diablotins, and precolumbian pyroclastic-flow aprons on the NW flank are relatively unmodified by erosion. Historical eruptions are not known from Morne Diablotins. However the volcano has a youthful appearance, and seismic swarms have occurred nearby in recent years. Photo by Paul Jackson, 1998 (Seismic Research Unit, University of West Indies). Cloud-draped Morne Diablotins volcano rises above the leeward coast of Dominica. This little known volcano is the largest on Dominica and one of the largest of the Lesser Antilles. Two coalescing lava domes form the summit of 1430-m-high Morne Diablotins, and precolumbian pyroclastic-flow aprons on the NW flank are relatively unmodified by erosion. The sharp-topped peak in the right foreground is the Morne Espagnol (Barbers Rock) lava dome. No historical eruptions are known from Morne Diablotins. Photo by Lee Siebert, 2002 (Smithsonian Institution). Morne Espagnol, also known as Barbers Block, is a steep-sided Pliocene lava dome that rises to 365 m above the coast on the NW flank of Morne Diablotins volcano, whose summit is hidden in the clouds. The massive volcano, the largest on Dominica, is capped by a complex of at least five lava domes. Block-and-ash flow deposits radiate away from the summit and reach the coast. The Global Volcanism Program has no maps available for Morne Diablotins. There are no samples for Morne Diablotins in the Smithsonian's NMNH Department of Mineral Sciences Rock and Ore collection. DECADE Data The DECADE portal, still in the developmental stage, serves as an example of the proposed interoperability between The Smithsonian Institution's Global Volcanism Program, the MAGA Database, and the EarthChem Geochemical Portal. The Deep Earth Carbon Degassing (DECADE) initiative seeks to use new and established technologies to determine accurate global fluxes of volcanic CO2 to the atmosphere, but installing CO2 monitoring networks on 20 of the world's 150 most actively degassing volcanoes. The group uses related laboratory-based studies (direct gas sampling and analysis, melt inclusions) to provide new data for direct degassing of deep earth carbon to the atmosphere. Large Eruptions of Morne Diablotins Information about large Quaternary eruptions (VEI >= 4) is cataloged in the Large Magnitude Explosive Volcanic Eruptions (LaMEVE) database of the Volcano Global Risk Identification and Analysis Project (VOGRIPA). MIROVA Middle InfraRed Observation of Volcanic Activity (MIROVA) is a near real time volcanic hot-spot detection system based on the analysis of MODIS (Moderate Resolution Imaging Spectroradiometer) data. In particular, MIROVA uses the Middle InfraRed Radiation (MIR), measured over target volcanoes, in order to detect, locate and measure the heat radiation sourced from volcanic activity. MODVOLC Thermal Alerts Using infrared satellite Moderate Resolution Imaging Spectroradiometer (MODIS) data, scientists at the Hawai'i Institute of Geophysics and Planetology, University of Hawai'i, developed an automated system called MODVOLC to map thermal hot-spots in near real time. For each MODIS image, the algorithm automatically scans each 1 km pixel within it to check for high-temperature hot-spots. When one is found the date, time, location, and intensity are recorded. MODIS looks at every square km of the Earth every 48 hours, once during the day and once during the night, and the presence of two MODIS sensors in space allows at least four hot-spot observations every two days. Each day updated global maps are compiled to display the locations of all hot spots detected in the previous 24 hours. There is a drop-down list with volcano names which allow users to 'zoom-in' and examine the distribution of hot-spots at a variety of spatial scales.